Far from the madding crowd, and distant from the world of trendy hotspots and beach raves, Marari’slietmotifs are space and silence. And little else. (Though you can be assured of endless amounts of both). Highlights include: Boutique accommodation at eco resort at beautiful Marari Beach, daily breakfast, “Farm Kitchen” dining experience including cooking class, Daily morning yoga, interactive evening cooking sessions in the evening, private transfers to and from airport. Far from the madding crowd, and distant from the world of trendy hotspots and beach raves, Marari’slietmotifs are space and silence. And little else. (Though you can be assured of endless amounts of both). A sprawl of lawns, far-flung lotus ponds and whispering coconut groves, all threaded through with stone- flagged pathways. A wind-break of palms runs the length of the property, and beyond, is only the sand, the sea and the sky all whispering their special language. 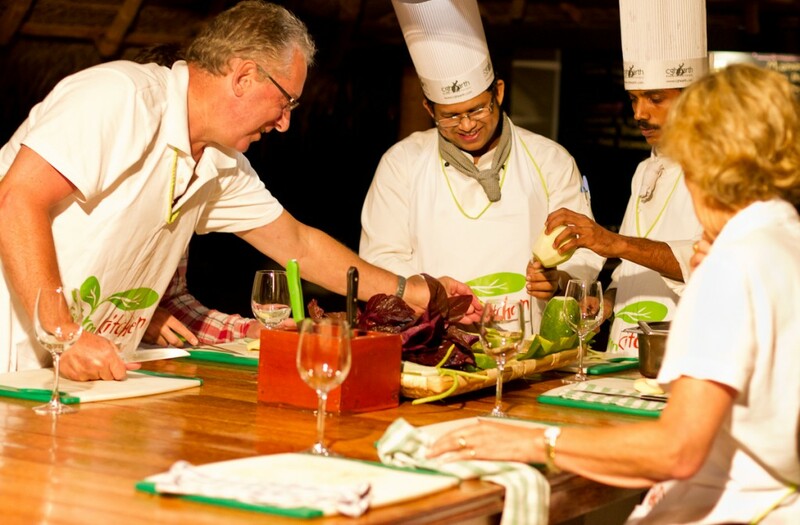 Report at Farm Kitchen at 6pm for a unique dining experience which includes picking your veggies, and an interactive cooking class with the chef in an outdoor setting. The Marari culinary journey is as multi-layered and subtle as one of our curries.Thefoundation is, of course the fruits of the ocean. Fresh fish and shellfish -crafted into an endless array of possibilities.The next layer is just-picked produce from our own organic farm. A day of relaxtion. You can book in for your Ayurveda massage or Shirodhara. Visit the kitchen for a cooking demonstration. 3 varieties of turtles, and even 10 kinds of frogs. As for the birds, there are too many to even name. Morning free, then transfer to airport for onward journey.